This is the one-stop Visual Basic 2019 tutorial and resource center. The tutorial is written in plain language to help everyone masters Visual Basic 2019 programming effortlessly. VB.NET is included in Visual Studio 2019 Preview version released by Microsoft recently. The VB IDE and syntaxes remain basically the same. Therefore, if you have already familiar with the earlier versions of VB.Net, you should have no problem learning VB2019, the latest version of VB.NET programming language. 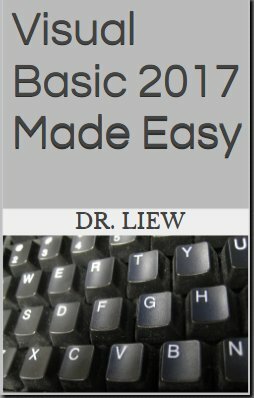 I would recommend you grab a copy of my book Visual Basic 2017 Made Easy if you prefer offline learning. Since the syntaxes and programming logic are similar to VB2019, so you should have no problem learning VB2019 by following the lessons in the book.